An obligately thermophilic strain ZY-10 was isolated from the crude oil in a high-temperature oilfield, which was capable of degrading heavy crude oil. Phenotypic and phylogenetic analysis demonstrated that the isolate should be grouped in the genus Geobacillus, which shared the highest similarity (99%) of the 16S rDNA sequence to Geobacillus stearothermophilus. However, the major cellular fatty acid iso-15:0 (28.55%), iso-16:0 (24.93%), iso-17:0 (23.53%) and the characteristics including indole production, tolerance to NaN3 and carbohydrate fermentation showed some difference from the recognized species in the genus Geobacillus. The isolate could use tridecane, hexadecane, octacosane and hexatridecane as sole carbon source for cell growth, and the digesting rate of long-chain alkane was lower than that of short-chain alkane. When the isolate was cultured in the heavy crude oil supplement with inorganic salts and trace yeast extract, the concentration of short-chain alkane was significantly increased and the content of long-chain alkane was decreased, suggesting that the larger hydrocarbon components in crude oil were degraded into shorter-chain alkane. Strain ZY-10 would be useful for improving the mobility of crude oil and upgrading heavy crude oil in situ. Most oil reservoirs have become depleted and marginal after recovery of crude oil for hundred years, although more than 40% crude oil is still reserved in those reservoirs (Brown, 2010; Sen, 2008). It is not economically attractive to recover the residual crude oil by conventional means due to the high percentage of heavy crude oil, which is highly viscous and cannot easily flow to production wells under normal reservoir conditions (Hao and Lu, 2009; Hasanuzzaman et al., 2007). It will be beneficial to the recovery of heavy crude oil if asphaltene and long-chain alkane in highly paraffinic crude could be converted into the transportable fluid portion (C7-C15) by suitable methods (Leon and Kumar, 2005). In fact, the microbial cracking of long-chain paraffin can promote the mobility of heavy crude oil and lower the cloud point (Etoumi, 2007; Gudiña et al., 2012). Therefore, it is significant to find a microbial strain capable of upgrading the heavy crude oil in situ (Sood and Lal, 2008). Some microbes were isolated for hydrocarbon degradation, which can degrade n-alkane C18-C20 into shorter chains (Gudiña et al., 2012), or convert the heavy hydrocarbon fraction into C15-C20 hydrocarbon (Etoumi, 2007). Recently, much more attention was paid to the genus Geobacillus due to its tolerance to high temperature (Nazina et al., 2001). Some Geobacillus species were found to be able to use hydrocarbon as carbon and energy source for cell growth. G. stearothermophilus KTCC-B7S grew well when pentadecane (C15), hexadecane (C16) and heptadecane (C17) was used as sole carbon source (Sorkhoh et al., 1993) and Geobacillus uzenensis could utilize C10-C16 alkane, methane-naphthenic and naphthenic-aromatic oil (Nazina et al., 2001). G. stearothermophilus DSM 22 utilizes only C10 and C11 alkane (Nazina et al., 2001). Nine Geobacillus strains were isolated for degrading long-chain alkane from a volcano island (Meintanis et al., 2006). Geobacillus thermodenitrificans NG80-2 also could utilize long-chain alkane (C15-C36) (Feng et al., 2007) and Geobacillus kaustophilus TFRI NSM could degrade alkane from C14 to C32 (Sood and Lal, 2008). The capability of microbes degrading and utilizing hydrocarbon in crude oil varies with the used Geobacillus species (Kohr, 2011). In searching for microbes improving the mobility of crude oil and upgrading heavy crude oil in situ, we isolated Geobacillus sp. strain ZY-10 from crude oil, which can grow well on heavy crude oil. It has been found that the long-chain hydrocarbon component in the heavy crude oil could be degraded into shorter-chain alkane. In this paper, we describe the isolation and some properties of this hydrocarbon-degrading strain. Isolation of hydrocarbon-degrading strain and culture condition. Approximately 2 g crude oil sample, collected from the Liaohe oilfield in the northeast of China, was suspended in 50 ml sterile water containing 0.15 g Tween-80 and 10 glass beads in diameter of 0.5 cm and shaken at 60°C and 120 rev/min. After the crude oil was completely emulsified, an aliquot of 10 ml emulsified crude oil was inoculated into 100 ml nutrient broth and incubated at 60°C and 120 rev/min for 2 days. The liquid culture was transferred into fresh nutrient broth at 10% inoculum and incubated in the same conditions for another 2 days. After five cycles of such transformation and incubation for bacterial enrichment, a 10-fold serial dilution of the enriched culture with sterile saline was spread on the selective medium plates. All plates were incubated at 60°C for 48 h. Colonies with different colony characteristics were selected from the selective medium plates and incubated in 100 ml of the liquid selective medium without agar at 60°C and 120 rev/min for 5 days. The extracellular surface activity and the residual crude oil in the culture supernatant were analyzed. One strain producing maximal surface activity and degrading most crude oil was selected. To ensure strain purity, the obtained isolate was streaked on nutrient broth agar plates and a single colony was chosen for further study. The purified isolate was stored at -80°C in nutrient broth mixed with sterile glycerol at a final concentration of 16% (v/v). For routine use, it was preserved on a nutrient broth agar slant at 5°C. The nutrient broth consisted of (per liter) 5 g NaCl, 5 g beef extract and 10 g peptone. The selective medium plates were composed of (per liter) 4.112 g NaNO3, 3.4 g KH2PO4, 1.5 g Na2HPO4, 0.2 g MgSO4•7H2O, 0.2 g yeast extract, 1.0 g crude oil and 2 g agar. Morphological, physiological and biochemical characterization. The morphology of colony and cell were determined after culturing on nutrient broth agar plate at 60°C for 24 h. Cell morphology was observed using transmission electron microscope (JEM-1200 EX, Japan) and phase-contrast microscope (Leica DM4000B, Germany). When transmission electron microscopy was used, the specimen was prepared by fixing cells with 5% (w/v) glutaraldehyde and 1% (w/v) osmium tetroxide, and ultrathin sections of the sample embedded in epoxy resin were prepared with an ultramicrotome, stained with uranyl acetate and lead citrate. The motility of cells was determined by phase-contrast microscopy using the hanging-drop technique (Murray et al., 1994). The spore formation was examined after the cells were cultured in the nutrient broth supplemented with 5 mg/l manganous sulfate monohydrate. Gram staining was performed using the Hucker method (Murray et al., 1994). The oxidase, catalase, urease, denitrification and Voges-Proskauer reaction were tested as described by Smibert and Krieg (1994). The hydrolysis of starch, casein and gelatin and H2S production were examined by the methods described elsewhere (Li et al., 2003). Medium containing (per liter) 5 g beef extract, 10 g peptone, 3 g NaCl, 2 g NaHPO4•12H2O, 5 g of various carbohydrates and 0.04 g bromothymol blue was used for testing carbohydrate fermentation. The isolate was incubated on the Simmons Agar plate with citrate, formate and acetate respectively for examining the capacity of utilizing citrate, formate and acetate. Cell growth was measured by OD600nm after it static incubation for 24 h in nutrient broth. The growth optimum was determined at 40, 50, 60, 70, 75, 80 °C and pH 7.0, or pH 4.0, 5.0, 6.0, 7.0, 8.0, 9.0, 10.0 and 60°C. Halotolerance was tested in nutrient broth with 0, 0.5, 1.5, 2.5, 3.0 and 3.5% (w/v) NaCl at 60 °C and pH 7.0. Phylogenetic analysis. Genomic DNA was extracted from the cells growing on the nutrient broth agar plate for 24 h. Amplification and determination of 16S rDNA gene sequence were performed by Takara Bio. Co. (Dalian, China). To avoid misreading as a result of PCR error, the PCR fragment was sequenced twice. The 16S rDNA sequences of the closely related strains to the isolate ZY-10 were retrieved by comparing with those available strains in the GenBank/EMBL databases using the BLAST program (Altschul et al., 1990) and at Ribosomal Database Project-II (Cole et al., 2003). The MegAlign program in DNASTAR software package (Dnastar Inc., USA) were used for similarity analysis with the sequences of closely related strains (Hagström et al., 2002). The sequences of closely related strains were aligned using CLUSTAL X program and corrected manually. The phylogenetic analyses were performed using the PHYLIP software package as described previously (Li et al., 2003). The statistical signification of the groups obtained was assessed by bootstrapping using the programs Seqboot, Dnadist, Neighbor and Consense in the Phylip software package. Cellular fatty acid analysis. The isolate was cultured on a nutrient broth agar plate for 24 h, and the sample for fatty acid analysis was prepared according to the protocol described by Sasser (1990). Briefly, 40 mg cells were mixed with 1 ml reagent containing 45 g sodium hydroxide in 300 ml aqueous methanol (methanol : distilled water, 1:1, v/v) and saponified at 100°C for 30 min. After methylation in 2 ml acidified methanol (6 mol/l hydrochloric acid and methanol, 13:11, v/v) at 80°C for 10 min, cellular fatty acids methyl esters were extracted with methyltert-butyl ether (1:1) and washed with 3 ml sodium hydroxide (1.2 %). Identification of the cellular fatty acid composition was carried out using the Sherlock Microbial Identification System (Tighe et al., 2000). Biodegradation of heavy crude oil by strain ZY-10. After static cultivation in LB medium at 60°C for 24 h, the cells in 6 ml broth were harvested by centrifugation at 3500 g for 20 min. After being washed twice with sterile saline, the cells were resuspended in 6 ml sterile saline and inoculated into mineral salt fermentation medium (60 ml) supplemented with 0.6 g crude oil in 100 ml conical flask and incubated statically at 60°C for 15 days. The mineral salt fermentation medium contained (per liter) 4.112 g NaNO3, 3.4 g KH2PO4, 1.5 g Na2HPO4, 0.2 g MgSO4•7H2O and 0.2 g yeast extract, giving 1.05% salinity. Utilization of n-alkanes as sole carbon source by strain ZY-10. An aliquot of 6 ml resuspended cells was inoculated into 60 ml mineral salt fermentation medium in 100 ml conical flask, in which 2% tridecane, 2% hexadecane, 0.2% octacosane or 0.2% hexatriacontane were used as sole carbon source. During the static cultivation at 60°C, the tridecane and hexadecane remaining in the culture were measured within 15 days and octacosane and hexatriacontane remaining in the culture were measured within 25 days. Analysis of fractions in the crude oil. The residual crude oil in the liquid culture was extracted three times with 20 ml chloroform, and the combined organic phase was dehydrated with 12 g anhydrous sodium sulfate for 24 h. The oil sample was dissolved in petroleum ether after removing chloroform and left for 24 h at room temperature to precipitate asphaltene. The residual oil was further separated into saturated hydrocarbons, aromatic hydrocarbons and non-hydrocarbons by adsorption chromatography (Hao and Lu, 2009; Giger and Blumer, 1974). The net weight of the oil components was determined respectively after the solvent was volatilized. The fraction of aromatic hydrocarbon dissolved in cyclohexane was determined by scanning in the range of 200-400 nm (White et al., 1993). The saturated hydrocarbon fraction in heavy crude oil was analyzed by Agilent GC6890 equipped with flame ionization detector and methyl polysiloxane capillary column OV-1 (30 m × 0.32 mm × 0.3 μm). Split injections were conducted with nitrogen as carrier. Injector and detector temperature was at 300°C. The oven temperature was set to 80°C for 2 min, raised to 200°C at a rate of 5°C/min for 2 min, then raised to 280°C at a rate of 8°C/min for 30 min. The residual n-alkanes in the culture were analyzed by the same method as the saturated hydrocarbon fraction in heavy crude oil. Statistical analysis. All the experiments were carried out in triplicate unless otherwise stated. Results were expressed as Means ± standard deviation of three replicates. Isolation of Geobacillus sp. strain ZY-10 degrading heavy crude oil. Fifty colonies in total with legible zone were grown out on selective medium plates after incubation at 60 °C for 48 h, suggesting that those strains could use crude oil for cell growth. About eight kinds of colonies with different colony characteristics were observed. After incubation in liquid selective medium, one colony degrading most crude oil and producing maximal surface activity was obtained, and designated as ZY-10. Morphology of isolate ZY-10. The colony growing on the nutrient broth agar plate was smooth, convex, circular and cream-colored with entire margins and 2-3 mm in diameter after incubation at 60°C for 24 h. The vegetative cells were motile, Gram-negative, rod-shaped, usually 7-9 μm long and 0.7-0.9 μm wide. Capsule (Fig. 1A) and oval spore (Fig. 1B) with 1.0-1.5 μm in size were located terminally or subterminally, which was not swollen beyond the cell size. The length of cells in liquid culture was increased with extending culture time or after 12 h incubation at the salinity up to 2.5%, and a floccules suspension appeared in the culture at the same time. The longer cells showed straight or flexuous thread shape (Fig. 1C), which was not found at earlier incubation or lower salinity. Fig. 1. Micrograph (100 × magnification) of capsule (a), endospore (b), rod and thread shaped cell (c) of strain Y-10 under light microscope (a) and phase-contrast microscope (b, c). Physiological and biochemical characterization. Physiological and biochemical characteristics of the isolate are shown in Table I. Strain ZY-10 was facultatively anaerobic and could grow in the range of 0-3.0% NaCl. Acid was produced from glucose, D-xylose, maltose, fructose, ribose, trehalose, melibiose, palatinose, cellobiose, sucrose and mannitol, but not from glycerol, lactose, galactose, rhamnose, sorbitol, inositol, inulin, raffinose and L-arabinose. 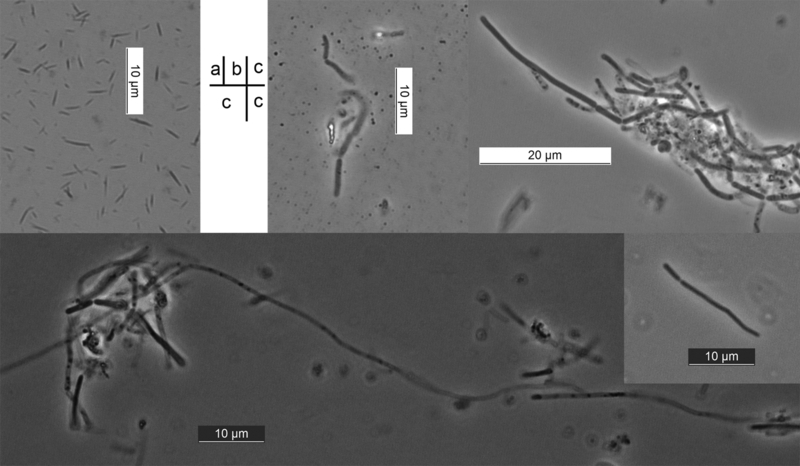 The taxonomic properties of the strain ZY-10 are consistent with the distinguishing key characteristics of the genus Geobactillus (Coorevits et al., 2011; Nazina et al., 2001) including Gram-positive rod-shaped cells, endospore formation, motile by peritrichous flagella, facultatively anaerobe, obligately thermophilic within the range of 37-75 °C for growth, and utilization of n-alkanes. Therefore, strain ZY-10 should be assigned to the genus Geobacillus. Symbol: “+” positive; “−” negative. Strain ZY-10 could grow in the temperature range of 50-75°C and optimal growth occurred at 60°C. Such growth temperature is suitable for use in high temperature oil reservoirs (Sood and Lal, 2008). At high temperature, some long-chain n-alkanes are in liquid state and their mass transfer on interphase is improved, which is more desirable for microbial uptake of hydrocarbon (Feitkenhauer et al., 2003). The oxygen concentration would affect the biodegradation of n-alkane. Rhodococcus ruber Z25 can degrade greatly the C6-C16 of n-alkane under aerobic condition but the C35-C45 of n-alkane under anaerobic condition (Zheng et al., 2012). The results of cell growth of strain ZY-10 in crude oil at the facultatively anaerobic culture suggested that the isolate could degrade n-alkane under micro-aerobic environment, which is close to the hydrocarbon biodegradation in situ in reservoirs with lower oxygen concentration. In addition, strain ZY-10 was able to produce bioemulsifier efficiently emulsifying paraffin (data not shown), which could selectively emulsify hydrocarbons with different chain-length resulting in improvement of the microbial accessing and utilizing hydrocarbon (Muligan et al., 2001; Wang, 2011). Phylogenetic analysis. The 16S rDNA gene sequence of strain ZY-10 was 1460 bp (accession JX878495, GenBank). The sequence similarity compared with the available reference sequences showed that strain ZY-10 was most similar to the species in the genus Geobacillus. Its sequence similarity is 93-98.8% with all other sequences in the genus Geobacillus except Geobacillus debilis with similarity less than 93%. The highest sequence similarity of 16S rDNA is 99% to that of the type strain of G. stearothermophilus (former name Bacillus stearothermophilus), and high sequence similarities (more than 98%) are to that of the other Geobacillus species including Geobacillus subterraneus, Geobacillus thermocatenulatus, Geobacillus vulcani, Geobacillus lituanicus, Geobacillus thermoleovorans, Geobacillus uzenensis and Geobacillus jurassicus. The phylogenetic tree constructed by neighbour-joining method on the basis of the 16S rDNA gene sequence was shown in Fig. 2. Fig. 2. 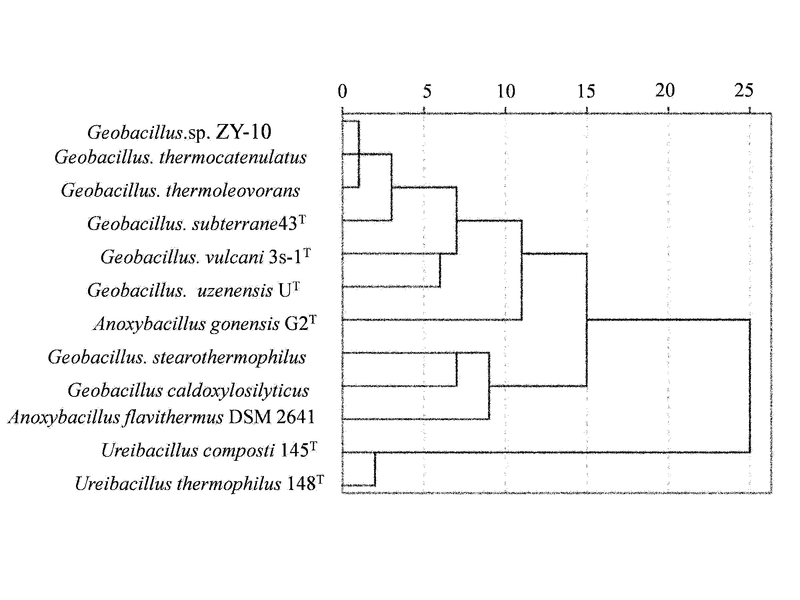 Phylogenetic position of strain ZY-10 among species of the genus Geobacillus. The bootstrap values are shown at branch points. Phylogenetic analysis based on 16S rDNA gene sequences also supported that strain ZY-10 was clear affiliated to the genus Geobacillus. The sequence similarity between strain ZY-10 and Geobacillus species was about 98.0%, which were in accordance with the proposal of 93% or 95% 16S rDNA gene sequence similarity as a cut-off value for delineating genera (Fox et al., 1992; Wagner-Döbler et al., 2004). Strain ZY-10 showed the highest level of similarity to B. stearothermophilus with 99% homology and higher similarity to B. thermodenitrificans with 97.7% homology, whereas both the species have been incorporated in the genus Geobacillus (Nazina et al., 2001), giving further evidence that the new strain should be a member of the genus Geobacillus. As shown in the phylogenetic tree (Fig. 2), the isolate was clearly clustered into the clade of the genus Geobacillus and the closest species was B. stearothermophilus (G. stearothermophilus). Cellular fatty acids analysis. The iso-branched saturated acids including iso-15:0, iso-16:0 and iso-17:0 was the main fatty acids in the genus Geobacillus species which was over 60% of the total cellular fatty acids (Nazina et al., 2001). As shown in Table II, the major fatty acids of strain ZY-10 were iso-branched saturated acids including iso-15:0, iso-16:0 and iso-17:0, the content of which was 28.55%, 24.93%, 23.53% respectively, accounted for about 77% of the total fatty acid. Strain ZY-10 exhibited the same major fatty acids profile as the genus Geobacillus species, the major fatty acids content of which is close to that of G. stearothermophilus, suggesting that the strain ZY-10 should be a member of the genus Geobacillus. The dendrogram of fatty acid similarity was derived from the cluster analysis by Euclidian distance based on the fatty acid profile (Fig. 3). It summarizes the relatedness of the fatty acid composition of some thermophilic strains closely related to strain ZY-10. As shown in Fig. 3, strain ZY-10 belonged to the same cluster with G. thermoleovorans and G. thermocatenulatus, but did not cluster closely with G. stearothermophilus. Species: 1, G. vulcani; 2, G. stearothermophilus; 3, G. thermocatenulatus; 4, G. thermoleovorans; 5, G. uzenensis; 6, G. subterrane (Caccamo et al., 2000; Nazina et al., 2001). Identification of strain ZY-10 as a new member of the genus Geobacillus. As shown in Table I, strain ZY-10 could be distinguished from its nearest apparent phylogenetic neighbor Geobacillus spp. in a number of important characteristics, including acid production from glycerol, mannitol, D-xylose and L-arabinose, the ability to hydrolyze gelatine, casein and starch, indole production and tests in oxidase, catalase and urease. Especially the capacity of growth in nutrient broth supplemented with 0.02% sodium azide can distinguish strain ZY-10 from G. stearothermophilus, because this closest species is sensitive to sodium azide (White et al., 1993). The content of C18:1ω9c is 3.07% in strain ZY-10 that is higher than that in other strains, especially the species in the genus Geobacillus. The content of unsaturated fatty acids is higher in the alkalotolerant strains like Bacillus firmus and Bacillus alcalophilus than that in any other strains (Kaneda, 1991). The growth ability at pH 10.0 was correlated with the character of lipids in the cell membranes for strain ZY-10. Therefore, it appears that strain ZY-10 represents a new member of the genus Geobacillus. Cell growth on crude oil. The cell growth in medium with crude oil as sole carbon source is shown in Fig. 4. Strain ZY-10 grew slowly at the beginning of the cultivation and rapidly grew after incubation for 12 days. 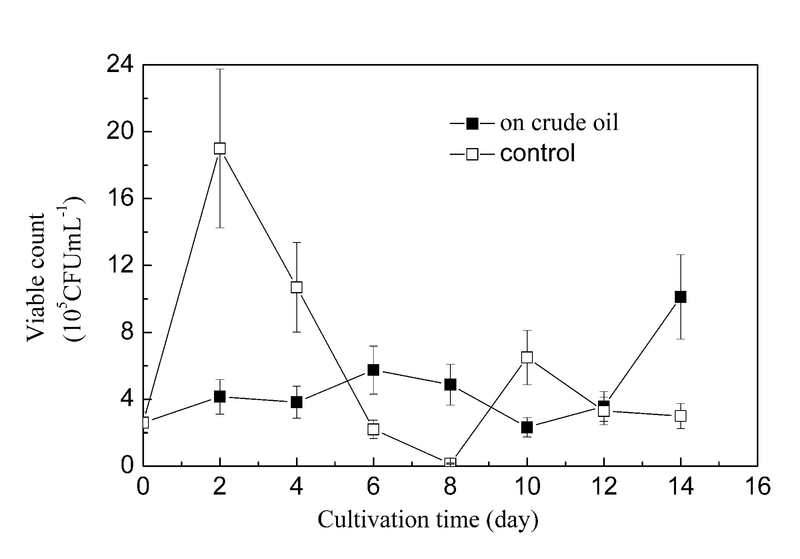 For the control without crude oil as carbon source, the viable count increased rapidly at the earlier period of cultivation, and after that it decreased (Fig. 4). Fig. 4. Cell growth of strain ZY-10 with crude oil as carbon source in the mineral salt fermentation medium at 60°C. Some components in crude oil are toxic to strain ZY-10 or the solubility of crude oil in water is too low. With the extension of culture time, the cells gradually adapted to the crude oil and utilized it to produce metabolites that could improve the dissolution of crude oil in water. Therefore, the growth rate of strain ZY-10 was intensified by utilizing crude oil and its metabolites. Therefore the cells grew quickly at the earlier stage of cultivation in the control without toxicity from crude oil, but cell growth declined in the following incubation because of a lack of a carbon source for cell growth. The viable cell count was determined as close to zero on the 8th day, presumably due to cells’ autolysis. However, after that strain ZY-10 showed a secondary growth speculatively by utilizing the autolysate from autolyzed cells. Variation of fraction content in the crude oil treated by strain ZY-10. As shown in Fig. 5, the content of saturated hydrocarbon, aromatic hydrocarbon and asphaltenes decreased and non-hydrocarbon content increased in the crude oil treated by strain ZY-10. The data in Fig. 5 demonstrates that strain ZY-10 could utilize saturated hydrocarbon, aromatic hydrocarbon and asphaltenes to produce non-hydrocarbon such as alcohol, aldehyde, ketone and carboxylic acid by oxidizing hydrocarbons and asphaltenes in the process of culturing. It is similar to metabolism of aromatic hydrocarbon, asphaltenes and non-hydrocarbon in crude oil M851 by strain BNL-4-23 (Premuzic and Lin, 1999). Fig. 5. Content of fraction in the crude oil after treatment with strain ZY-10. Symbol: 1 – saturated hydrocarbon; 2 – aromatic hydrocarbon; 3 – non-hydrocarbon; 4 – asphaltenes. It is known that aromatic hydrocarbon has a maximum absorption at 205-240 nm. For naphthalene, acenaphthene, six hydrogenated pyrene, phenathrene and pyrene, the maximum absorption is at 211 nm, 218 nm, 225 nm, both 243 and 280 nm, 232 and 265 and 323 nm respectively. The aromatic hydrocarbons with more than four aromatic rings show the strongest absorbance at more than 350 nm, and at longer wave length when dissolved in cyclohexane (Halasinski et al., 2005; Mille et al., 1991). The absorbance of crude oil untreated and treated by strain ZY-10 was scanned in the wave length range of 200-400 nm and their absorption spectra are shown in Fig. 6. The absorbance of the treated crude oil decreased by comparing with the crude oil without inoculation of strain ZY-10 in the ultraviolet region. This demonstrated that the content of aromatic hydrocarbon fraction in the crude oil decreased when the crude oil was treated by strain ZY-10. It can be inferred that strain ZY-10 could utilize and/or degrade aromatic hydrocarbons with less than three aromatic rings but not with more than four aromatic rings in the tested crude oil. Fig. 6. 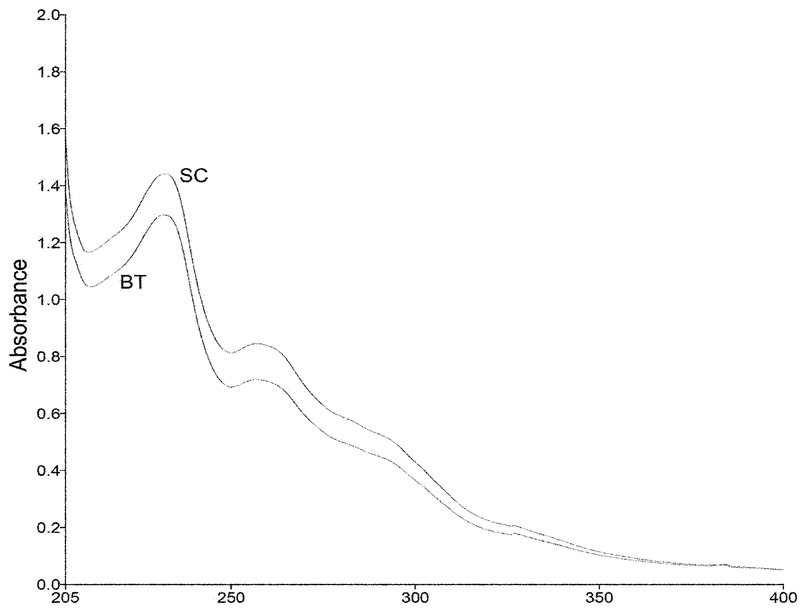 Changes in absorption spectra (200–400 nm) of crude oil after treatment with strain ZY-10. Symbol: SC – sterile control; BT – sample treated by strain ZY-10. Biodegradation of saturated alkane fraction in heavy crude oil by strain ZY-10. In the heavy crude oil incubated with strain ZY-10 for 15 days, the alkane with retention time of 10-25 min increased and the alkane with retention time of 25-60 min decreased when compared with the control sample of the sterilized crude oil untreated by strain ZY-10 (Fig. 7). The retention time of tridecane, hexadecane, eicosane, octacosane and hexatriacontane was at 12.9 min, 20.6 min, 30.7 min, 41.2 min and 69.7 min respectively on the gas chromatogram. Fig. 7. 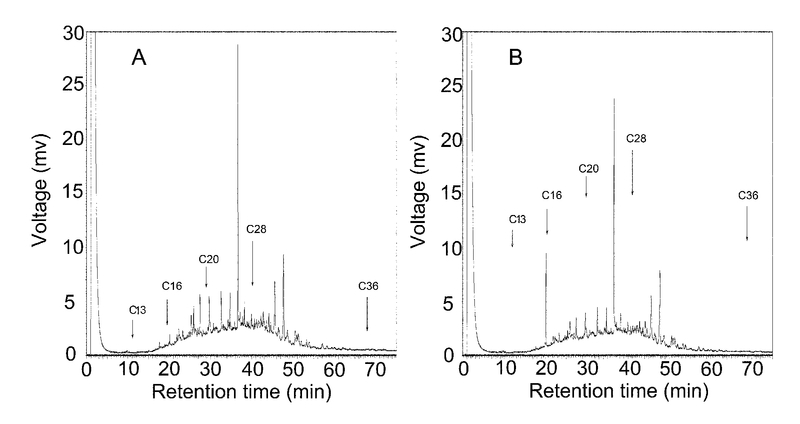 Gas chromatography of the saturated hydrocarbon fraction in sterile crude oil (A) and crude oil treated by strain ZY-10 (B). Crude oil is a complex mixture of hydrocarbon and other organic compounds, and the saturated hydrocarbon composition in the crude oil affects the bacterial degradation of alkane (Hao et al., 2004). The saturated hydrocarbons in heavy crude oil used in this study were mainly n-alkanes with chain length more than 16. As shown in Fig. 8, the analysis of alkane with chain length less than C36 in the crude oil showed that the content of C13-C16, C8-C13 and C16-C20 alkane increased by 155%, 117% and 106% respectively, and the content of C20-C28 alkane decreased by 2% at the same time, while there was nearly no change in the content of C28-C36 alkane. The content of tridecane, hexadecane and hexatriacontane significantly increased to 3-4 times of the control, and the content of eicosane and octacosane visibly decreased in the heavy crude oil treated by strain ZY-10. The results revealed that the rate of producing tridecane, hexadecane and hexatriacontane was faster than the rate of degrading or utilizing those three alkanes by strain ZY-10 when crude oil was used as carbon source. Although it is difficult to utilize larger compounds, strain ZY-10 could produce short-chain alkane by degrading hydrocarbon and other large molecular compounds. Fig. 8. Alkanes in crude oil treated and untreated by cultivating strain ZY-10, in which the clear column is the untreated crude oil and the filled column is the treated crude oil by strain ZY-10, and clear triangle is the ratio of alkane in treated sample to that in sterile control in crude oil fermentation. According to the experimental results described above, the short-chain n-alkane (tridecane and hexadecane) in soluble state was known to be utilized more easily than the long-chain n-alkane (octacosane and hexatriacontane) in insoluble state by strain ZY-10. The long-chain n-alkane might be degraded slowly before being utilized for cell growth. The cultivation of strain ZY-10 in the heavy crude oil could result in a significant increase in the content of C13-C16 alkane (tridecane and hexadecane) and an increase in the content of C8-C13 and C16-C20 alkane, but in a decrease in the content of C20-C28 alkane. Premuzic and Lin (1999) reported that the content of long-chain n-alkane decreased and the content of short-chain n-alkane increased in crude oil when treated with strain BNL-4-23. 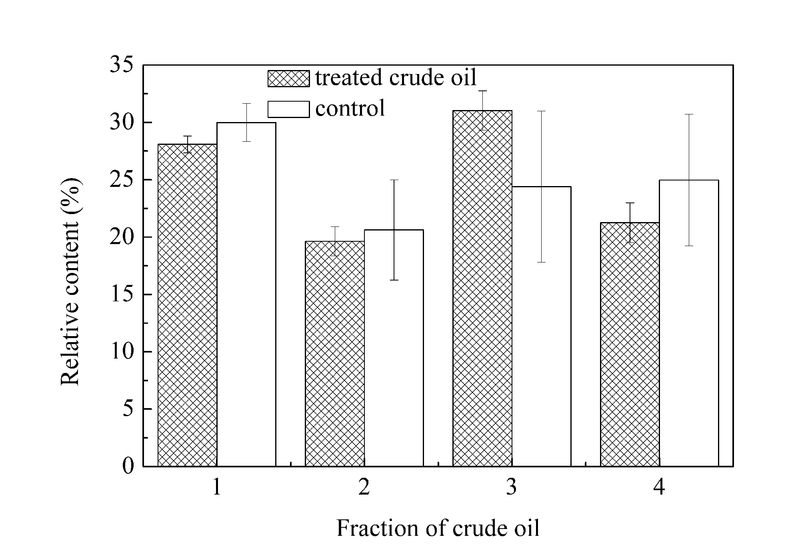 The degradation of crude oil by thermophilic strain TH-2 also displayed similar results (Hao et al., 2004). The bacteria that can increase the content of C10-C20 n-alkane in crude oil have received much attention in recent years because the increasing content of short-chain alkane as a solvent in crude oil is beneficial to crude oil recovery. It can be concluded that strain ZY-10 is able to convert heavy crude oil, such as long-chain n-alkane, macromolecular aromatic hydrocarbon and larger hydrocarbon, into short-chain n-alkanes. 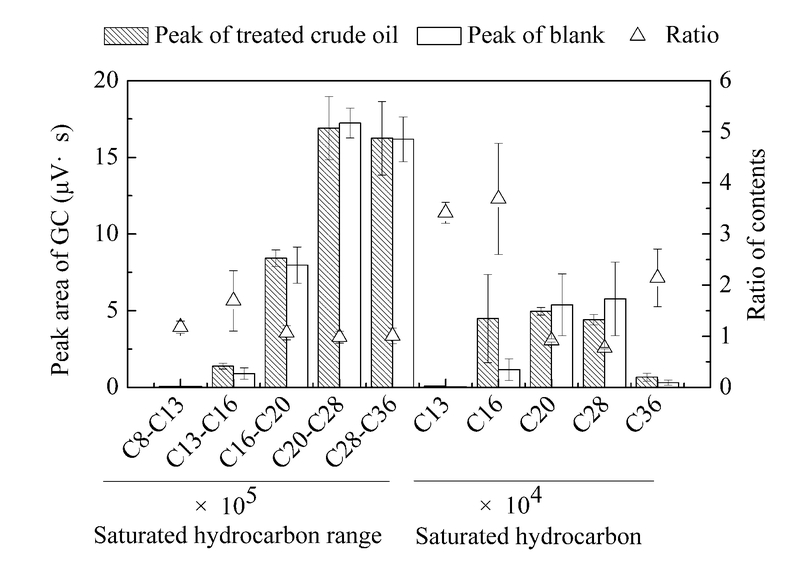 The oxidization of hydrocarbons in heavy crude oil by strain ZY-10 was limited consequently under static cultivation because of the low oxygen concentration. However, this assumption needs to be verified experimentally. The specificity of the emulsifier should be examined further to clarify the relationship between the characteristic of the emulsifier and the preferential degradation of alkane by strain ZY-10. Utilization and biodegradation of n-alkane (C13, C16, C28 or C36) by strain ZY-10. When tridecane, hexadecane, octacosane and hexatriacontane were used as sole carbon source respectively, the growth and residual n-alkanes were determined (Fig. 9). Tridecane and hexadecane could be utilized within 15 days and octacosane was utilized within 25 days. As shown in Fig. 9, cell growth of strain ZY-10 was fast and there was no lag phase in the growth curve when tridecane and hexadecane were used as carbon source. However, a long lag phase was observed when strain ZY-10 was incubated in the medium with octacosane and hexatriacontane as carbon source, in which the lag phase in octacosane was longer than that in hexatriacontane. 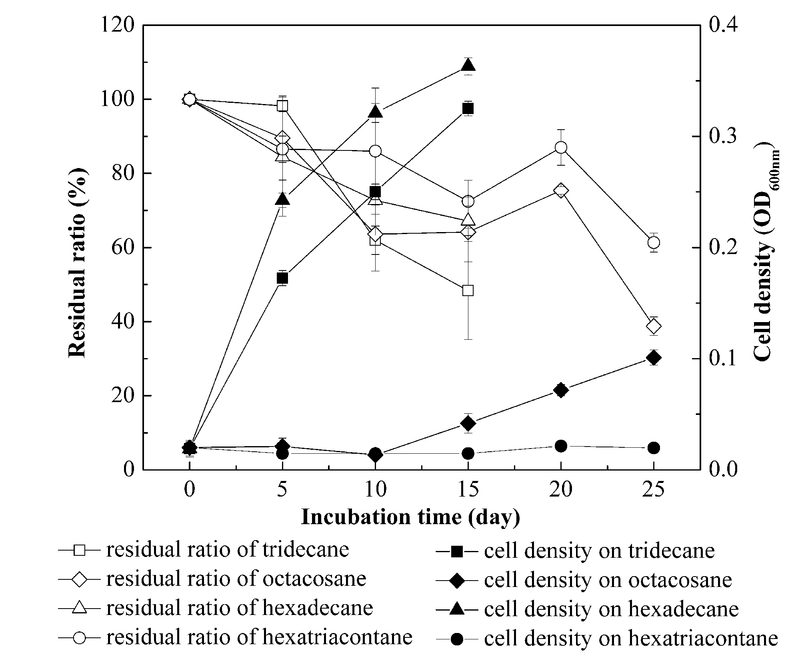 Moreover, the viable cell content decreased in the first five day culture following a long lag phase in the growth curve when hexatriacontane was used as carbon source. The cell density cultivated in tridecane or hexadecane was much more than that in octacosane or hexatriacontane. Fig. 9. Cell growth of strain ZY-10 and residual n-alkane when tridecane (■, □), hexadecane (▲, ∆), octacosane (♦, ◊), hexatriacontane (●, ○) were used respectively as sole carbon source. The results shown in Fig. 9 indicate that a high ratio of alkane remained when the longer alkane was utilized (in comparison between tridecane and hexadecane, between octacosane and hexatriacontane). We can conclude that strain ZY-10 prefers to utilize the shorter-chain n-alkanes (tridecane and hexadecane), but might first absorb longer-chain n-alkanes (octacosane and hexatriacontane) on the cell surface and then slowly convert them into the easier-used compounds (including short-chain n-alkanes). Most bacterial cells prefer to use n-alkanes with chain length from 10 to 20 (Wentzel et al., 2007). For example, G. stearothermophilus MH-1 could degrade alkane in the range of C12-C31, and C12-C20 alkane was degraded much easily (Liu et al., 2009). It can be concluded that strain ZY-10 as a thermophilic bacterium capable of degrading hydrocarbons has a potential to improve the mobility of crude oil and upgrade heavy crude oil in situ. Financial support provided by Natural and Scientific Funding of China (31371742), Special Funding for Agroscientific or Marine Research in Public Interest (201303095, 201405003), Program for Science and Technology Department of Dalian (2013B11NC078) are greatly acknowledged. Altschul S.F., W. Gish, W. Miller, E.W. Myers and D.J. Lipman. 1990. Basic local alignment search tool. J. Mol. Biol. 215:403-410. Brown L.R. 2010. Microbial enhanced oil recovery (MEOR). Curr. Opin. Microbiol. 13:316-320. Caccamo D., C. Gugliandolo, E. Stackebrandt and T.L. Maugeri. 2000. Bacillus vulcani sp. nov., a novel thermophilic species isolated from a shallow marine hydrothermal vent. Int. J. Syst. Evol. Microbiol. 50:2009-2012. Cole J.R., B. Chai, T.L. Marsh, R.J. Farris, Q. Wang, S. Kulam, S. Chandra, D. McGarrell, T.M. Schmidt and G.M. Garrity. 2003. The Ribosomal Database Project (RDP-II): previewing a new autoaligner that allows regular updates and the new prokaryotic taxonomy. Nucleic Acids Res. 31:442-443. Coorevits A., A.E. Dinsdale, G. Halket, L. Lebbe, P. De Vos, A. Van Landschoot and N.A. Logan. 2011. Taxonomic revision of the genus Geobacillus: emendation of Geobacillus, G. stearothermophilus, G. jurassicus, G. toebii, G. thermodenitrificans and G. thermoglucosidans (nom. corrig., formerly ‘thermoglucosidasius’); transfer of Bacillus thermantarcticus to the genus as G. thermantarcticus comb. nov.; proposal of Caldibacillus debilis gen. nov., comb. nov.; transfer of G. tepidamans to Anoxybacillus as A. tepidamans comb. nov.; and proposal of Anoxybacillus caldiproteolyticus sp. nov. Syst. Appl. Microbiol. 34:419-423. Etoumi A. 2007. Microbial treatment of waxy crude oils for mitigation of wax precipitation. J. Petrol. Sci. Eng. 55:111-121. Feitkenhauer H., R. Müller and H. Märkl. 2003. Degradation of polycyclic aromatic hydrocarbons and long chain alkanesat 60-70°C by thermus and Bacillus spp. Biodegradation. 14:367-372. Feng L., W. Wang, J. Cheng, Y. Ren, G. Zhao, C. Gao, Y. Tang, X. Liu, W. Han, X. Peng and others. 2007. Genome and proteome of long-chain alkane degrading Geobacillus thermodenitrificans NG80-2 isolated from a deep-subsurface oil reservoir. Proc. Natl. Acad. Sci. U. S. A. 104:5602-5607. Fox G.E., J.D. Wisotzkey and P. Jurtshuk. 1992. How close is close: 16S rRNA sequence identity may not be sufficient to guarantee species identity. Int. J. Syst. Bacteriol. 42:166-170. Gudiña E.J., J.F.B. Pereira, L.R. Rodrigues, J.A.P. Coutinho and J.A. Teixeira. 2012. Isolation and study of microorganisms from oil samples for application in microbial enhanced oil recovery. Int. Biodeterior. Biodegrad. 68:56-64. Hagström Å., T. Pommier, F. Rohwer, K. Simu, W. Stolte, D. Svensson and U.L. Zweifel. 2002. Use of 16S ribosomal DNA for delineation of marine bacterioplankton species. Appl. Environ. Microbiol. 68:3628-3633. Hao R. and A. Lu. 2009. Biodegradation of heavy oils by halophilic bacterium. Prog. Nat. Sci. 19:997-1001. Hao R., A. Lu and Y. Zeng. 2004. Effect on crude oil by thermophilic bacterium. J. Petrol. Sci. Eng. 43: 247-258. Hasanuzzaman M., A. Ueno, H. Ito, Y. Ito, Y. Yamamoto, I. Yumoto and H. Okuyama. 2007. Degradation of long-chain n-alkanes (C36 and C40) by Pseudomonas aeruginosa strain WatG. Int. Biodeterior. Biodegrad. 59:40-43. Kaneda T. 1991. Iso- and anteiso-fatty acids in bacteria: biosynthesis, function, and taxonomic significance. Microbiol. Mol. Biol. R. 55:288-302. Kohr W.J. 2011. Microbial enhanced oil recovery methods, U.S. Patent 2011/0067856. filed Aug. 26, 2010, and issued Mar. 24, 2011. Leon V. and M. Kumar. 2005. Biological upgrading of heavy crude oil. Biotechnol. Bioprocess Eng. 10(6):471-481. Li X., C. Zhao, Q. An and D. Zhang. 2003. Substrate induction of isomaltulose synthase in a newly isolated Klebsiella sp. LX3. J. Appl. Microbiol. 95:521-527. Liu Y.C., T.T. Zhou, J. Zhang, L. Xu, Z.H. Zhang, Q.R. Shen and B. Shen. 2009. 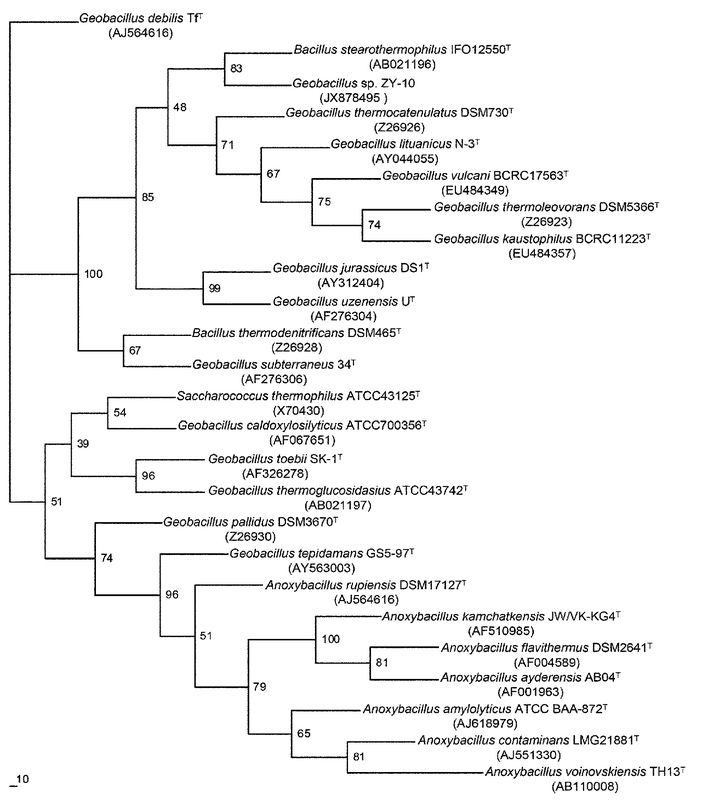 Molecular characterization of the alkB gene in the thermophilic Geobacillus sp. strain MH-1. Res. Microbiol. 160:560-566. Meintanis C., K.I. Chalkou, K.A. Kormas and A.D. Karagouni. 2006. Biodegradation of crude oil by thermophilic bacteria isolated from a volcano island. Biodegradation 17:3-9. Muligan C.N., R.N. Yong, B.F. Gibbs. 2001. Surfactant-enhanced remediation of contaminated soil: a review. Eng. Geol. 60:371-380. Murray R.G.E., R.N. Doetsch and C.F. Robinow. 1994. Determinative and cytological light microscopy, pp. 22-41. In: Gerhardt, P., R.G.E. Murray, W.A. Wood and N.R. Krieg (eds.). Methods for General and Molecular Bacteriology. American Society for Microbiology, Washington D.C.
Nazina T.N., T.P. Toruova, A.B. Poltaraus, E.V. Novikova, A.A. Grigoryan, A.E. Ivanova, A.M. Lyseko, V.V. Petrunyaka, G.A. Osipov, S.S. Belyaev and others. 2001. Taxonomic study of aerobic thermophilic bacilli: descriptions of Geobacillus subterraneus gen. nov., sp. nov. and Geobacillus uzenensis sp. nov. from petroleum reservoirs and transfer of Bacillus stearothermophilus, Bacillus thermocatenulatus, Bacillus, Bacillus kaustophilus, Bacillus thermoglucosidasius and Bacillus thermodenitrificans to Geobacillus as the new combinations G. stearothermophilus, G. thermocatenulatus, G. thermoleovorans, G. kaustophilus, G. thermoglucosidasius and G. thermodenitrificans. Int. J. Syst. Evol. Microbiol. 51:433-446. Premuzic E.T. and M.S. Lin. 1999. Induced biochemical conversions of heavy crude oils. J. Petrol. Sci. Eng. 22:171-180. Sasser M. 1990. Identification of bacteria by gas chromatography of cellular fatty acids, MIDI Technical Note 101. Newark, DE: MIDI Inc.
Sen R. 2008. Biotechnology in petroleum recovery: the microbial EOR. Prog. Energy Combust. Sci. 34:714-724. Smibert R.M. and N.R. Krieg. 1994. Phenotypic characterization. pp. 607–654 In: Gerhardt P., R.G..E. Murray, W.A. Wood and N.R. Krieg (eds). Methods for General and Molecular Bacteriology. ASM Press, Washington, D.C.
Sood N. and B. Lal 2008. Isolation and characterization of a potential paraffin-wax degrading thermophilic bacterial strain Geobacillus kaustophilus TERI NSM for application in oil wells with paraffin deposition problems. Chemosphere 70:1445-1451. Sorkhoh N.A., A.S. Ibrahim, M.A. Ghannoum and S.S. Radwan. 1993. High-temperature hydrocarbon degradation by Bacillus stearothermophilus from oil-polluted Kuwaiti desert. Appl. Microbiol. Biotechnol. 39:123-126. Tighe S.W., P. de Lajudie, K. Dipietro, K. Lindstrom, G. Nick, and B.D.W. Jarvis. 2000. Analysis of cellular fatty acids and phenotypic relationships of Agrobacterium, Bradyrhizobium, Mesorhizobium, Rhizobium and Sinorhizobium species using the Sherlock Microbial Identification System. Int. J. Syst. Evol. Microbiol. 50:787-801. Wagner-Döbler I., H. Rheims, A. Felske, A. El-Ghezal, D. Flade-Schröder, H. Laatsch, S. Lang, R. Pukall and B.J. Tindall. 2004. Oceanibulbus indolifex gen. nov., sp. nov., a North Sea alphaproteobacterium that produces bioactive metabolites. Int. J. Syst. Evol. Microbiol. 54:1177-1184. Wang X.B., C.Q. Chi, Y. Nie, Y.Q. Tang, Y. Tan, G.. Wu and X.L. Wu. 2011. Degradation of petroleum hydrocarbons (C6–C40) and crude oil by a novel Dietzia strain. Bioresour. Technol. 102:7755-7761. Wentzel A., T.E. Ellingsen, H.K. Kotlar, S.B. Zotchev and M. Throne-Holst. 2007. Bacterial metabolism of long-chain n-alkanes. Appl. Microbiol. Biotechnol. 76:1209-1221. White D., R.J. Sharp and F.G. Priest. 1993. A polyphasic taxonomic study of thermophilic bacilli from a wide geographical area. Antonie Van Leeuwenhoek 64:357-386. Zheng C., L. Yu, L. Huang, J. Xiu and Z. Huang. 2012. Investigation of a hydrocarbon-degrading strain, Rhodococcus ruber Z25, for the potential of microbial enhanced oil recovery. J. Petrol. Sci. Eng. 81:49-56.